I think the whole country can agree, it’s ridiculously hot this summer. Beyond feeling cranky and lethargic, this weather makes me really, really not want to cook. Or spend time in the kitchen. Or do anything that might raise my body temp above meditative. But there are really only so many popsicles and frozen berries a person can eat before the body starts to demand something more…substantial. These lettuce wraps are just that.Made with riced cauliflower, dried apricots, and crunchy, creamy pine nuts, they taste hearty and satisfying, but come together quickly and without using any heat. Or you could also just munch on it right out of the bowl. Like I said, minimal effort wins points here! If you try my Savory Apricot Lettuce Wrap recipe, I’d love to hear what you think!! Please leave a comment below, or instagram with the hashtag #makeadlib . Don’t forget to tag @makeadlib so I can see your delicious creation! 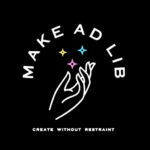 Thanks for visiting Make Ad Lib! Join me in my mission to be creative every day! My blog is full of patterns, tips and tricks to bring beauty and creativity into your life. Click here to learn more about me, and sign up for my newsletter to join me as we Make Ad Lib! Make Ad Lib contains affiliate links. This means I receive a small commission only if you click on one of my links and make a purchase. Thank you so much for supporting my mission to create without restraint! All images, recipes, and content is Copyright 2018, unless otherwise noted. Do not reproduce any image, recipe, or content without written permission.